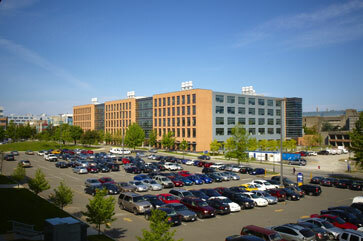 * Central locations close to the Woodward Biomedical Library and health, life and natural sciences research facilities. Recent developments in immunology, molecular biology and biotechnology have opened many new possibilities in industry and medicine for the application of microbial-based technologies. Thus the opportunities for qualified students will continue to increase in both universities and industry. The Department has established itself as a leading centre for immunology, recombinant DNA technology and for research into infectious diseases. Another notable research field is applied and environmental microbiology, with the focus mainly on sources of environmental problems and solutions involving microorganisms (bacteria, fungi and algae). Despite their small size, microbes exert a huge influence on all terrestrial and aquatic environments thereby affecting all plants and animals, including humans. As both academic and industrial research opportunities abound in such areas as Biotechnology, Bioremediation, Agriculture, and Food Processing, the career outlook for graduates from the Department is excellent. The atmosphere in the Department reflects the success of the individual labs in developing new areas of research. There is excellent rapport between faculty and graduate students and extensive sharing of information and technology between laboratories and students. There are, in addition, many collaborative research projects between groups within the Department and with laboratories in other departments at U.B.C. and at other universities. The breadth of research opportunities, the distinguished faculty, and the high quality of the graduate program makes the Department a stimulating and challenging place in which to carry out studies in Microbiology and Immunology. Only 30 minutes from the heart of downtown Vancouver, the University of British Columbia holds an international reputation for excellence in advanced research and learning. The spectacular UBC campus is a 'must-see' for any visitor to the city -- where snow-capped mountains meet ocean, and breathtaking vistas greet you around every corner. 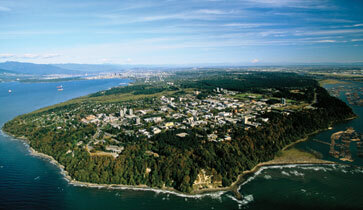 The university boasts some of the city's best attractions & recreation facilities, including the Museum of Anthropology, the Chan Centre for the Performing Arts, the UBC Botanical Garden and Centre for Plant Research, and endless opportunities to explore forested trails in the adjoining 763-hectare Pacific Spirit Regional Park. The mountainous terrain and fjord-like coastline of British Columbia provide a variety of opportunities for outdoor recreation within easy reach of the University. Three ski areas are about a half hour drive from the campus and the world class ski facilities at Whistler and Blackcomb mountains are only an hour and a-half drive away. Many other excellent areas and facilities for mountaineering, camping, fishing, sailing, swimming and hiking are readily accessible. Vancouver is a rapidly expanding metropolis, the third largest city in Canada. The current population of over a million people is extremely cosmopolitan and includes large Chinese, East Indian, Greek and Italian communities. This diverse population is reflected in the number and variety of restaurants which include specialized ethnic restaurants as well as seafood houses, pizza parlours and excellent gourmet restaurants. 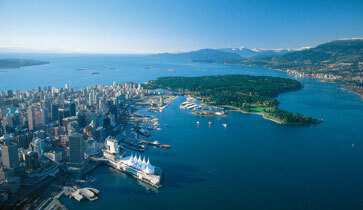 One of Vancouver's attractions is the mild climate. The metropolitan area does not experience the severe winter weather that is characteristic of most parts of Canada. There are usually a few snowfalls between December and February, but the snow melts within hours, or a few days, and, the temperature seldom drops below freezing. Spring weather predominates from March to May when temperatures rarely drop below 5°C. Although June to August are the warmest months, temperatures rarely exceed 23°C and the humidity is low. The mild climate permits year-round participation in many recreational activities such as tennis, hiking, golfing and sailing. The proximity of the mountains makes it possible to go swimming and skiing on the same day at some times of the year. Vancouver also offers outstanding cultural facilities. There are several theatre groups, opera and dance companies, art galleries and a variety of musical ensembles from symphony orchestra to string quartets. Many of these offer reduced ticket rates to students. A folk music festival is held annually and folk musicians from various countries are featured regularly at the Vancouver East Cultural Centre. The many clubs in town offer a diverse selection of other musical entertainment from jazz to rock. The MacMillan Planetarium, Bloedel Conservatory, Stanley Park Aquarium and Science World provide additional recreational opportunities. There are also a number of professional and amateur sports teams resident in the city including the Canucks (hockey), the Lions (football) and the Canadians (baseball). These features make Vancouver a desirable city in which to live and study.